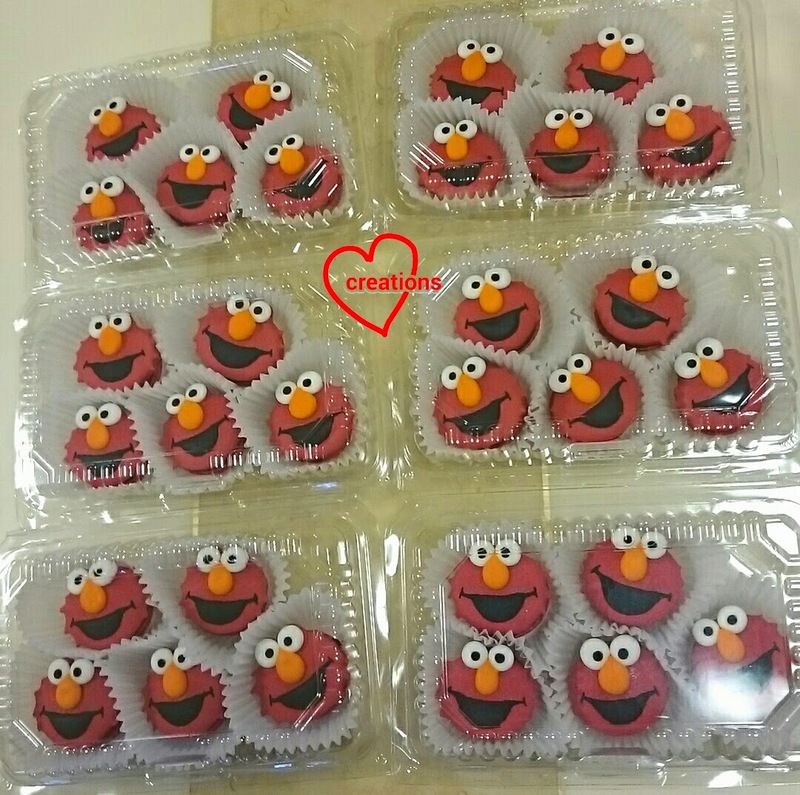 "Elmo song" kept ringing in my head as I made these! In order to reduce the amount of artificial red colouring needed, I used two types of natural food colouring to achieve this. 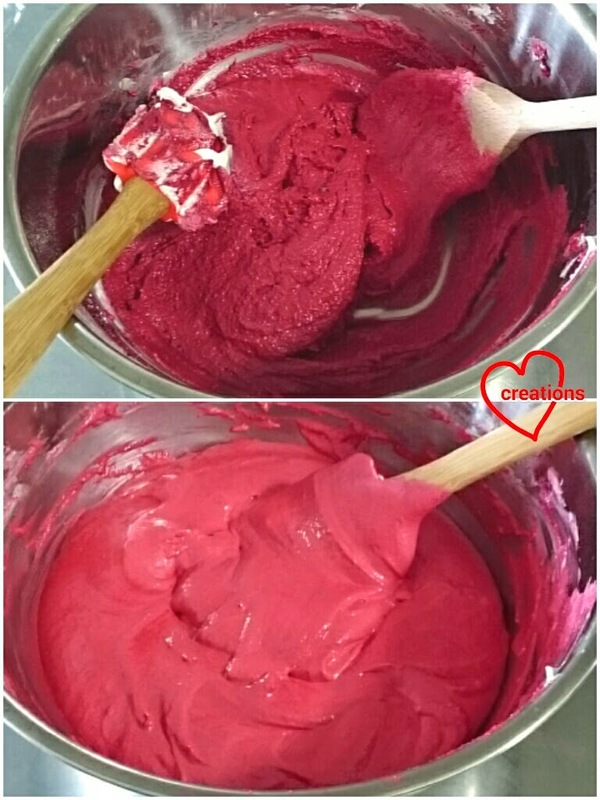 I did a brief search on the Internet for beetroot powder or red yeast powder based macaron recipes and find that the resulting macarons are a very dull reddish brown, so some artificial colouring is still needed to make a bright but deep shade of red. I experimented with using fairly small amounts here but sufficient to significantly reduce the amount of artificial colouring used :). Susanne also reported that using too much red yeast causes her chiffon batter to bubble and deflate a bit so I didn't dare to use too much. *You may replace all of the food colour source with red gel colouring if you don't have any of the above items. 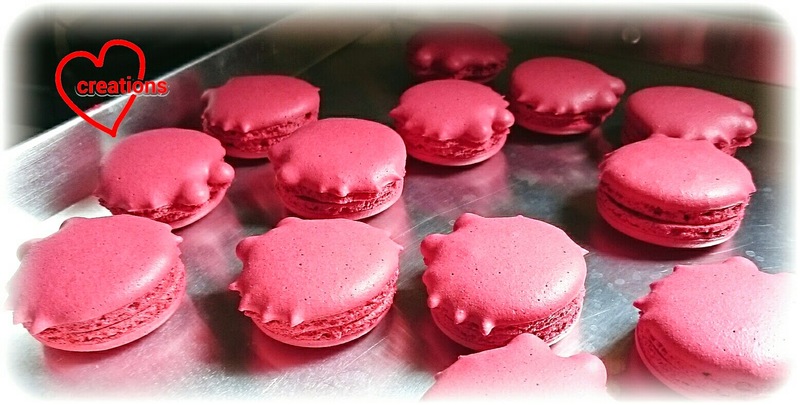 Beetroot and red yeast tend to give a brownish tinge to the macarons and deepen the shade of red. 1. 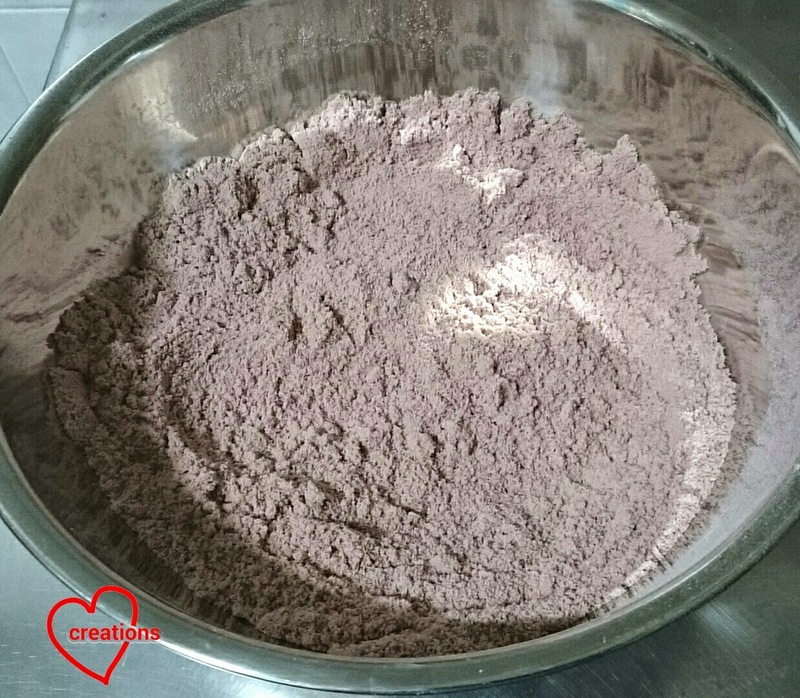 Sift together almond, icing sugar, red yeast powder and red color powder. As you can see, the colour is quite dull. This photo was taken before 1/4 tsp of red powder was added. 2. Dissolve beetroot powder in 80g of egg white and add the egg mixture to the flour mixture in step 1 to form the mass. 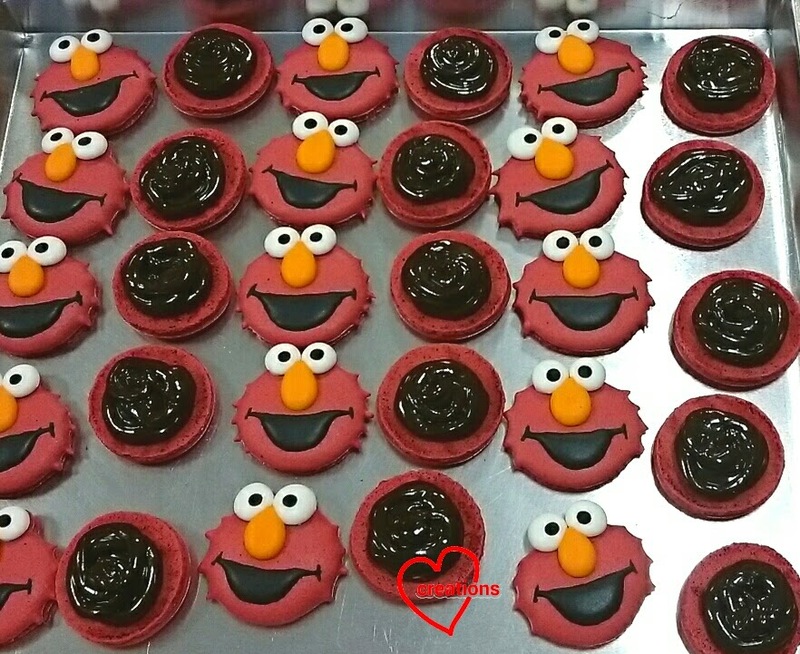 Add red gel food coloring. I counted about 12 drops of gel colouring but subsequently added more during the macaronage (not advisable for newbies!!) as the shade was not "red" enough. 3. Prepare the Italian meringue. Boil caster sugar and water over medium heat without stirring while beating the remaining egg whites in a clean metal bowl at medium-low speed. When the syrup temperature reaches 115°C, increase the mixer speed to high and gradually pour the syrup into the egg whites, taking care to avoid the beaters. It is important to make sure that the egg whites are not beaten past soft peak stage before syrup is poured in. Otherwise the meringue will be too stiff and difficult to incorporate into the mass. Continue beating on high for 10-12 minutes until the meringue is cool and firm/ stiff peaks form. 4. Fold the meringue into the mass in two additions. Use a fold and press motion until batter just begins to fall off the spatula in a continuous manner. Do watch a video demo many times to have a good feel of the consistency of the batter and folding technique. I have not gone for any macaron classes before so this is how I learn. Top: batter after first addition of meringue. Bottom: batter after macaronage is completed. 5. Transfer the batter into a piping bag fitted with a 5-6mm round tip and a bit of batter into another bag fitted with a 3mm tip. Pipe out ovals for bottom shell and Elmo's shape for top shell. Use a template under the baking sheet! Pipe oval for Elmo's head using the big tip, followed by two circles at the top for his eyes using the smaller tip. Use a toothpick to pull out the sides of his face to make the fuzzy edges. 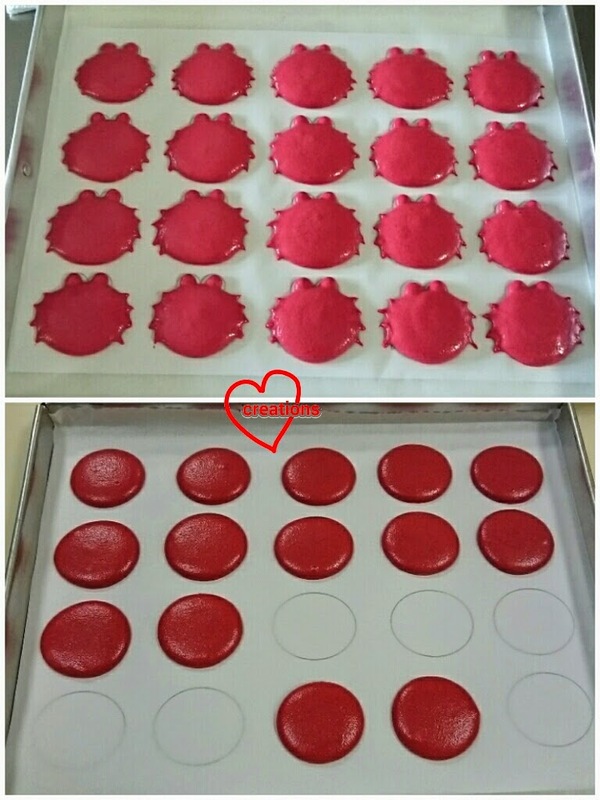 Remember that the batter will spread a little after piping so don't fill up your template completely. You can skip all these detailing and simply pipe round circles if you wish but don't you think he looks more endearing when you pay attention to the details? ;) Remember to tap the tray a few times to release air bubbles after piping. 7. Bake at 130°C with oven rack at lowest position for 17-22 minutes. Let the shells cool for 5 minutes before removing from tray. If the shells are still stuck on baking sheet, put them back in the oven to bake for a few minutes. Rotate your tray halfway through baking if your oven temperature is uneven. 8. Decorate the shells with royal icing. 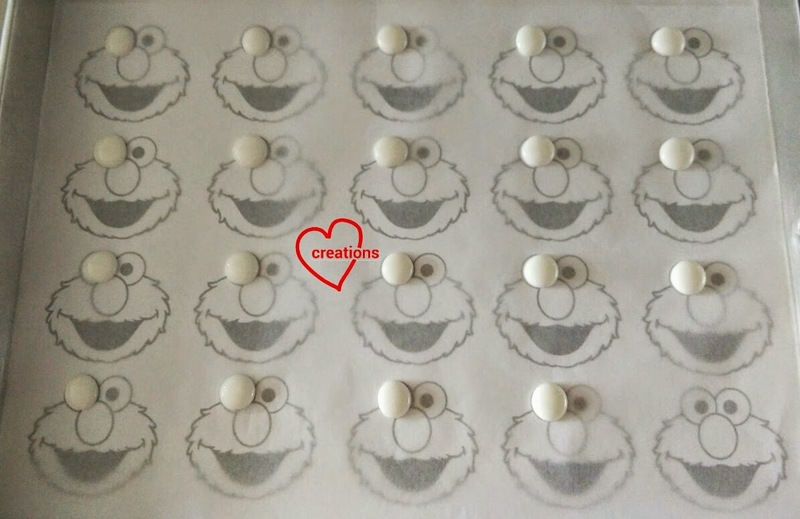 I iced circles on a baking sheet and dried them for Elmo's eyes. I just stuck the pre-iced eyes onto the macaron shells with a dab of royal icing. 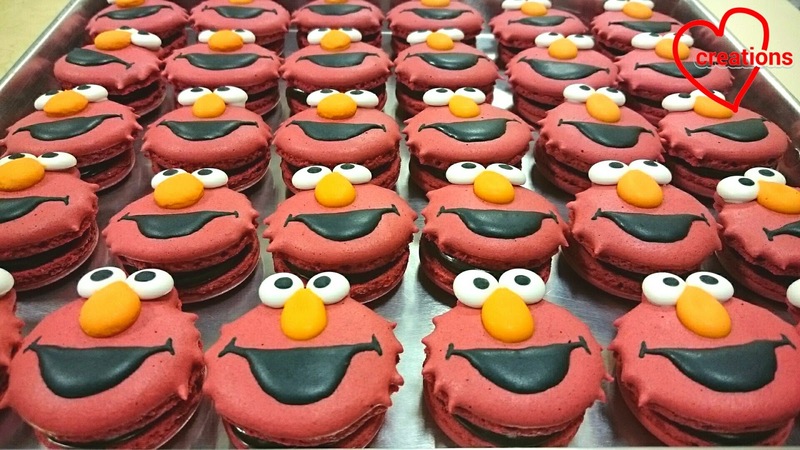 Use a mixture of orange, yellow and teeny toothpick dip of teal to create Elmo's nose colour. I used charcoal powder to colour the icing black. Let the icing dry completely before storing in airtight container if you are not filling them yet. You may oven dry at 60°C fan mode to speed things up. Do use toothpicks to paint or nudge the icing along for very fine lines. 1. Place chocolate and butter in a heatproof bowl. Boil the cream. 2. Pour boiling cream onto chocolate and use a spatula to stir the mixture in one direction until all chocolate has melted. 3. Let the ganache rest at room temperature and firm up for 1-2 hours before piping onto the shells. 4. Refrigerate at least 24h in airtight container before consuming. These can keep for a week plus. 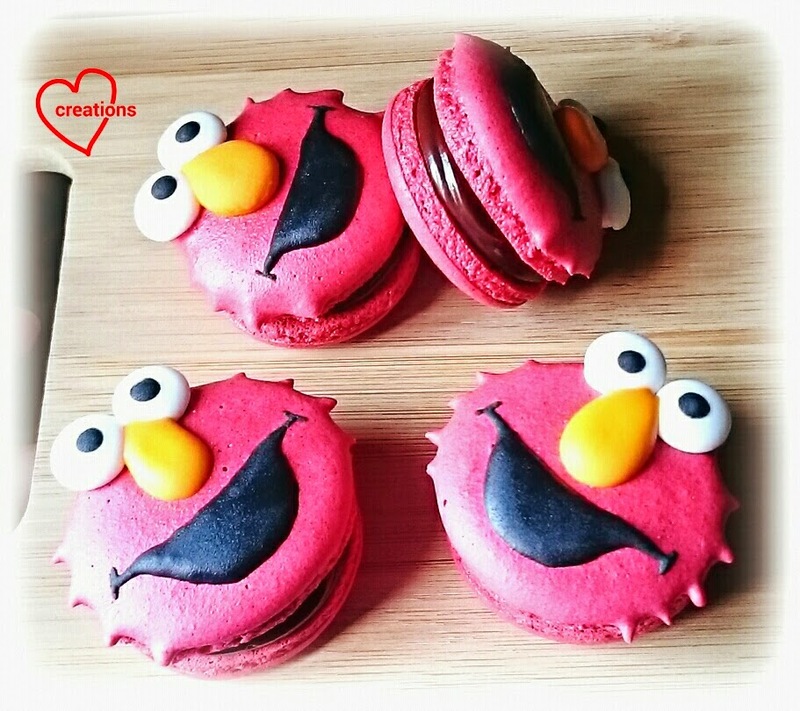 As usual, I couldn't resist the chance to play with leftover batter so keep a lookout for Angry Bird and ladybug macs in my future post! Hi Phay Shing, can you share on how you store leftover batter and how long you keep them? hi may I know where do you get the template from? I made my own templates based on images found from the internet.